In this article scope we make availability and some flexiblity for database maintenance operations about preventing “outdated update statistics” for DBAs , and now you are not depending just only SharePoint Daily Timer job which responsible update database statistics by using the proc_updatestatistics SQL procedure anymore. Our TechNet article “Best practices for SQL Server in a SharePoint Server farm” has now been updated with the same guidance and cross referencing the new KB article. Do not enable auto-create statistics on SharePoint content databases. Enabling auto-create statistics is not supported for SharePoint Server. SharePoint Server configures the required settings during provisioning and upgrade. Manually enabling auto-create statistics on a SharePoint database can significantly change the execution plan of a query. We recommend updating the SharePoint content database statistics daily using the FULLSCAN option from SQL Server. Although SharePoint does have a timer job to update statistics by calling proc_updatestatistics, we strongly recommend implementing a scheduled maintenance plan from SQL Server to ensure database statistics are reliably updated on a daily basis. For more information, see Outdated database statistics. When implementing the SQL Server maintenance plan to update the statistics on your SharePoint databases, it is not required to disable the job from SharePoint. However, because these maintenance tasks perform similar functions from both locations, it is permissible to disable the timer job from the SharePoint farm. Then you have checked that ContosoDB which is not present in SQL server but why are you getting this error with that database . This is an orphan database record issue . SharePoint has still have information about that database the record about that database present in SharePoint configuration database (inside the Object table) but in real there is no database present in SQL server with that name. You have verifed that if there is <fld type=”null” /> record in that xml. If you search for this ID in configuration database’s Object table for this content database;you will not find any record about it ;So it is an oprhan item. Ok so far so good , I can hear your question that how we get rid off this with a supported way ? – Well you shouldnt change SharePoint databases manually , it is not supported by Microsoft . Resolution is easy but It is a little bit tricky. To remove that oprhan database we will run a single command. The tricky part when you run this you will get an error ! Upss did i something wrong , NO! Well after run this command , just ignore the error .Normally it fixes the configuration database and cleans the orphan record . Check yourself again the XML configuration of the Web Application from SQL server by following SQL again. if you do not see the orphan <fld type=”null” /> , then you good to go 🙂 You can run the configuration wizard again . 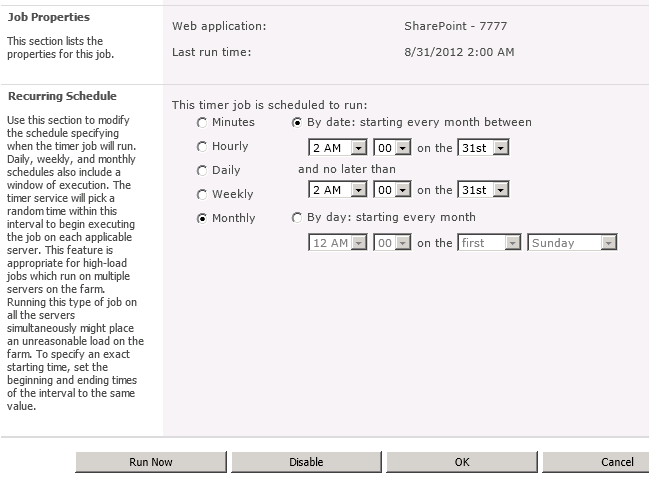 For SharePoint 2010 we have a dedicated TimerJob for doing this operation .Default schedule is set by monthly. 3) Click “Run Now” button. 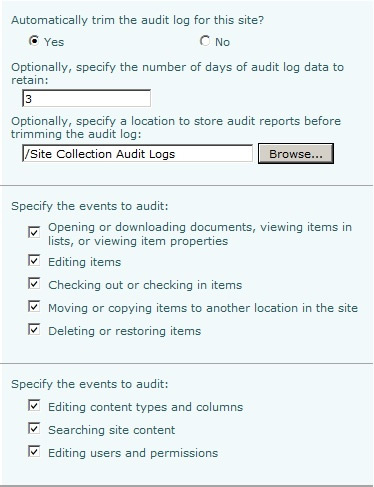 I would like to inform you about someting when you run this timer job it will use the value of retention (for example 3 ) which you set in Site Settings-> Site Collection Audit Settings . Even you set the “Automatically trim the audit log for this site” yes and set retention for 3 days (like in example) . 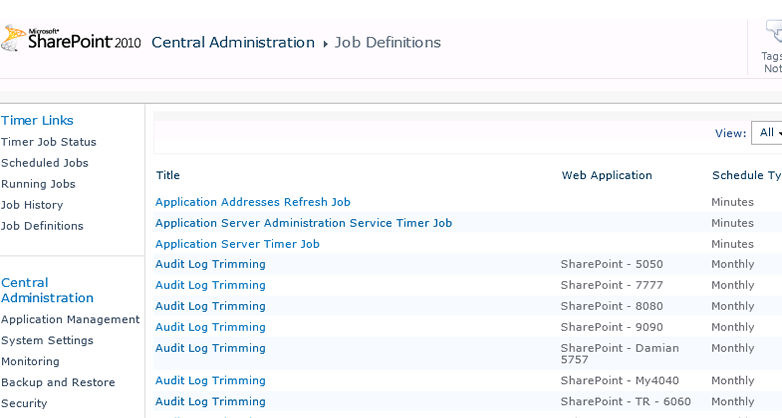 the logs will not be deleted from Content Database until “Audit Log Trimming” timer job is run.After timer job runs the logs until retention value ( 3 days in example) will be deleted. What if you set “Automatically trim the audit log for this site” as No . How could you clear old logs ? There is another way to do it by using PowerShell . you can able to give here a date as parameter like stsadm command. 1) Run SharePoint 2010 Powershell Console by administrator priviledges . You can fallow whats happening in background by tracing ULS logs in real time. And you can learn how many records are deleted. //See you next article . Only SharePoint 2010 SP1 (14.0.6029) and higher versions supports Microsoft SQL Server 2012 . Currently for MOSS2007 or WSS3.0 is not supported. Let me guess , if you are reading this article possible you may in the middle of a restore or migration issue and not able to restore User Profile Service Application . This warning means you can not restore old sycronization database (default name is Sync DB) .This is a by design issue and you do not allowed to do it. that’s why you are getting fallowing warning. For resolution just create a new Syncronization database. Don’t worry about the content in it because SharePoint will rebuild it once you configured User Profile Service Application correctly. In this article i am going to tell you how could you extract and restore a specific content database from backed up Sharepoint Full-Farm backup. First lets have look our target content database which we want to restore . 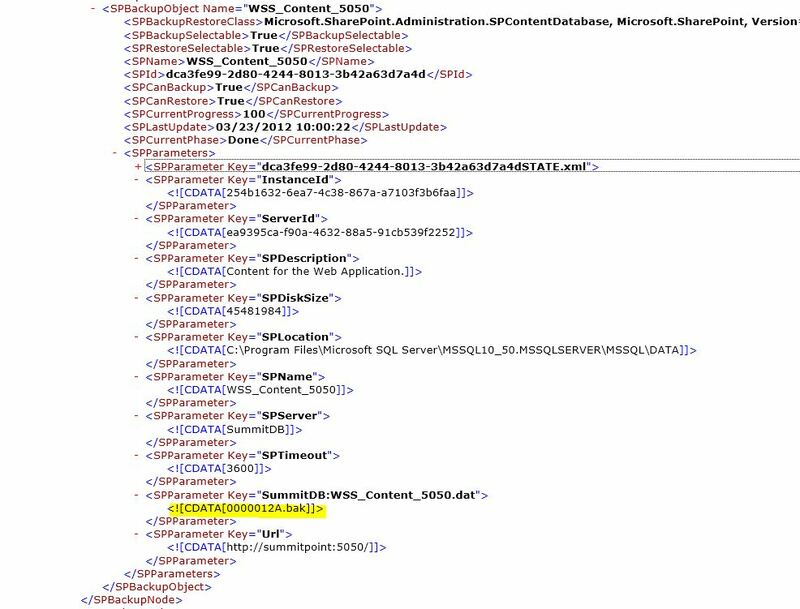 In my example the database name is “WSS_Content_5050” . 1) Open your Sharepoint Full Farm Backup folder. If you don’t know the backup folder you can find from Central Administration web site. 2) As you noticed when we order items by size in Sharepoint Full-Backup folder ( “spdbr0000”) you can see the biggest files . That files as usually SQL backup files of sharepoint databases but which file is our content database ? 3) If you order items by Type you can find the file which we are looking for named “spbackup.xml” .this file our backups index file in xml format. 4) than open this xml file in any editor and search your content database name in this file . 5) as you notices that “0000012A.Bak file . This is our content database’s backup file. 6) Copy this file to your SQL Server and now you can restore this file (if it is not corrupted) via Sql Server Management Studio . The server encountered an unexpected error and stopped. ERR: MMS(6016): sql.cpp(5633): Maximum stored procedure, function, trigger, or view nesting level exceeded (limit 32). What is a Recursive Triggers ? A requirsive trigger is a trigger that fired by the other triggers or intreacting object that fire the trigger when executed recursively. SQL Server also allows for recursive invocation of triggers when the RECURSIVE_TRIGGERS setting is enabled using ALTER DATABASE. With indirect recursion, an application updates table T1. This fires trigger TR1, updating table T2. In this scenario, trigger T2 then fires and updates table T1. With direct recursion, the application updates table T1. This fires trigger TR1, updating table T1. Because table T1 was updated, trigger TR1 fires again, and so on. The following example uses both indirect and direct trigger recursion Assume that two update triggers, TR1 and TR2, are defined on table T1. Trigger TR1 updates table T1 recursively. An UPDATE statement executes each TR1 and TR2 one time. Additionally, the execution of TR1 triggers the execution of TR1 (recursively) and TR2. The inserted and deleted tables for a specific trigger contain rows that correspond only to the UPDATE statement that invoked the trigger. Note:The previous behavior occurs only if the RECURSIVE_TRIGGERS setting is enabled by using ALTER DATABASE. There is no defined order in which multiple triggers defined for a specific event are executed. Each trigger should be self-contained. Disabling the RECURSIVE_TRIGGERS setting only prevents direct recursions. To disable indirect recursion also, set the nested triggers server option to 0 by using sp_configure. If any one of the triggers performs a ROLLBACK TRANSACTION, regardless of the nesting level, no more triggers are executed. How to change “Recursive Triggers Enabled” property to false ? From the SQL Server Management Studio, expand ‘System Databases’ > Right-click ‘Model’ | Properties | Options | under Miscellaneous section, set ‘Recursive Triggers Enabled’ property to ‘False’.